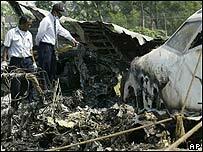 A plane crash in Indonesia which killed 21 people in March has been blamed on pilot error by the official inquiry. The Garuda Indonesia flight crashed on landing at Yogyakarta airport in March, and burst into flames. Australian diplomats and journalists were among the dead, leading to increased international pressure to find the causes of the disaster. 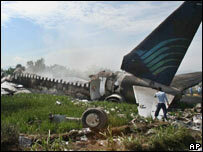 Indonesia's transport safety committee said the pilot was going 60% faster than he should have been on landing. The report said the pilot ignored the aircraft's warning system, which sounded alarms 15 times during the approach. He also ignored calls from the co-pilot to go around and take the approach again. On landing, the plane over-shot the runway and burst into flames. Rescue vehicles at the airport were unable to reach to accident site and some did not have the right fire suppressant. The report said that these factors may have cost many lives. The involvement of the Australian diplomats and journalists led to increased international pressure to find the causes of the disaster. The panel has made a series of recommendations to improve airline safety in Indonesia. But the country has a poor track record of implementing safety procedures and transport disasters are common.